Charles Joly is the king of ‘dealer’s choice.’ We all know what the dealer’s choice is, right? Well, if you don’t, it’s that decision you place solely on that guy or gal behind the bar when you don’t know what you want or simply can’t be bothered deciding. I’ve noticed in the past few years that some bars actually have ‘dealer’s choice’ listed as an option on their menu. Requesting a dealer’s choice implies trust and sometimes cements comradeship. It does, however, require a bartender that has an astute creative sensibility or a vast memory bank of drinks. Or both, as is the case with my good friend Charles. I witnessed this trait often during his tenure at Chicago’s Drawing Room and even more so from the tiny confines of The Office, a tiny bolthole of a bar tucked away beneath the award-winning Aviary where he was until recently the Beverage Director. For me it all starts with asking the right questions and Charles does this better than anyone. 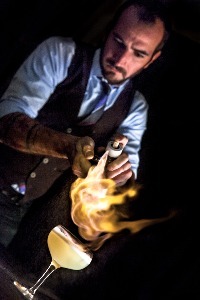 In fact, his quest to get the most appropriate and satisfying drink in front of every guest inspired this very article. Most customers will be proffered a cocktail menu as they approach the bar and will hopefully choose something from that list of beverages that you’ve spent weeks, maybe months, curating. If they want something ‘off menu,’ then they’re really putting their decision in the hands of the bartender on duty. But what if said bartender is not the creative type? Which is totally fine. Not every barkeep wants to grow up to be a mixologist (also totally fine). Not every bartender has a drink with lemongrass and lychee up their sleeve, you know, just in case. Nor does everyone need to know the original recipe for – or the etymology of – the Boulevardier. Those last two weren’t his way of coming on to me by the way; rather it allowed him to better understand if I’m going for dinner, perhaps I’m celebrating something significant, or maybe I’m on my way home for dinner and I’m in for a quick “one and done.” Or maybe I have friends in town and I’m going out for a big night. What you’re doing by asking such questions is essentially gathering information about that person and their tastes, either generally or at that exact moment. By listening carefully to the answers, and I mean really digesting the information, it will allow you to find the exact drink they wanted while perhaps enlightening them on a spirit or ingredient they either never knew existed or one they thought they didn’t usually like. Win win. I remember being at a very prominent New York bar a few years back when I asked the bartender for “something refreshing.” What I got, along with an arrogant smirk, was a Dirty Martini, which as we all know is about as far from refreshing as one could go on the flavor wheel. When I think ‘refreshing,’ I think Paloma, Tom Collins, Cube Libre, Americano, gin & tonic etc. Clearly he wasn’t actually listening. At The Daily, a small bar I opened in 2011 with the AvroKO Hospitality Group, I introduced a menu of six drinks that changed every day. What once seemed like a daunting task was actually executed extremely well because of a Rolodex of over 500 classic drinks from where we curated each daily menu. The best outcome from this concept was that the bartenders have been able to memorize all of these drinks because they make each of those six drinks dozens of times per night. Many return customers and regulars at The Daily often request a drink that was on the menu last night or last week or last month. They’ve also built up a great trust in the bartenders there because they know that they have a massive repertoire of drinks they can call on. So the dealer’s choice is an important part of the service model at The Daily and the bar staff need to able to come up with dozens of such drinks on a nightly basis. It’s a highly skilled professional who can pull this off with a smile.